[00:10:18] <PCW> hmm how do you make the latency test not run a base thread? [02:53:04] <skunkworks_> I think trying to explain why linuxcnc didn't go the machinekit route is a no-win situation..
[04:11:24] <skunkworks_> then - exporting with cutter comp enabled - one run with 0 tool diameter - then reloaded with .125 diameter cutter. [04:12:29] <skunkworks_> boy - I do have a short attention span..
[04:14:17] <cradek> I think I don't understand what you mean - are you using our cutter comp or dxf2gcode's cutter comp? [04:17:05] <skunkworks_> cradek: it allows you to enable cutter comp. (G41,42) it also allows you to change the direction of cut of the profile/. [04:19:01] <cradek> ah inside corners that are .25 arcs? [04:19:21] <skunkworks_> Most likely - has been a while since I have drawn it. 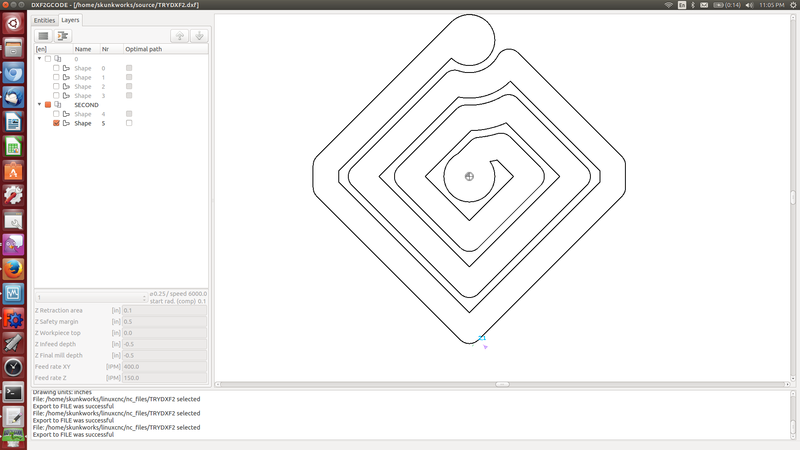 [04:19:52] <ssi> how common is it to use cutter compensation in linuxcnc and program actual path in cam? [04:20:58] <skunkworks_> it is nice for relatively simple profiles to use cutter comp - so you don't have to re-export everytime to adjust a part. [04:21:42] <ssi> skunkworks_: so that's what you're doing there? using a 0 diameter in cam, and letting cutter comp offset for you? [04:22:44] <skunkworks_> I want to get dad using it.. I think it will be easier for him. [04:23:34] <skunkworks_> and dxf2gcode would allow him to tell cut directions and easly turn off profiles. [04:23:58] * skunkworks_ just needs to setup the tool table better..
[04:24:53] <skunkworks_> cradek: it seems to tell you when it can't do it. [04:25:14] <skunkworks_> (cutter comp) so no surprise gouges. 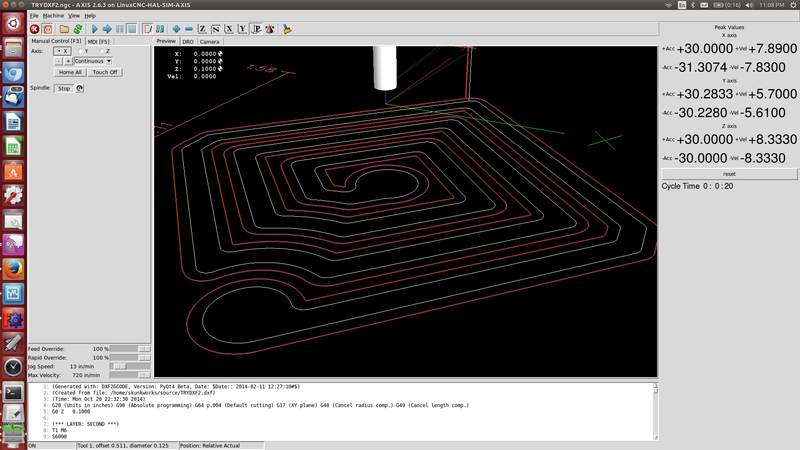 [04:25:43] <ssi> skunkworks_: is dxf2gcode your project? [04:26:01] <skunkworks_> heh - no.. I am not that focused or that good of a programmer..
[04:26:31] <skunkworks_> I had heard of it - but I didn't know it had a gui..
[04:26:47] <skunkworks_> it suposidly works on windows also..
[04:27:01] <skunkworks_> yes - 2.5d. [04:30:36] <skunkworks_> cradek: even so - the classic trajectory planner seems to only over shoot acceleration by 15% in very rare cases..
[04:32:10] <ssi> pyqt is taking ages to install! [04:33:01] <skunkworks_> I would not say that.. I have not heard anyone complain about the classic tp causing constrain violations.. Just that it was 'way to slow'..
[04:33:33] <skunkworks_> I had that installed already. from what I don't know. [04:36:56] <skunkworks_> I have been getting by with ace converter... so this is quite a step up I hope. [13:09:21] <decimad2> What I mean is how can I tell linuxcnc to move those 9 axes in parallel when g-code is basically (to my understanding) a sequential description format... Does linux-cnc do the kinematics? [13:30:24] <decimad2> is there a way to hand in commands directly without going to g-code? [13:46:10] <decimad2> trivkins pretends cartesian axes? [13:48:35] <decimad2> Do commercial milling machines interface to commercial cam software through g-code still? [13:57:38] <jepler> decimad2: you read http://linuxcnc.org/docs/html/motion/kinematics.html ? [14:01:23] <decimad2> I now did, that stuff I think I understand already... :) What drives me nuts is that feed control needs absolute positions of parallel axes in relation to each other to work... is there a way to set this up? [14:02:01] <archivist> are you thinking of a gantry, what machine? [14:02:12] <jepler> if you're talking about obeying the acceleration and velocity constraints of joints as opposed to acceleration and velocity constraints of cartesian axes, linuxcnc does not have a good solution for this. [14:05:49] <archivist> are you thinking of a plain 4 axis mill? [14:14:42] <decimad2> Okay, so I was not too way off. [14:18:37] <decimad2> So it's obvious that linux cnc will represent that with multiple available frames to the kineamtics...? [14:21:04] <jepler> "G93 - is Inverse Time Mode. In inverse time feed rate mode, an F word means the move should be completed in [one divided by the F number] minutes. For example, if the F number is 2.0, the move should be completed in half a minute." [14:21:51] <decimad2> So I will do the feed rate calculation in my theoretical cam software and use f-codes to communicate the paths? [14:27:54] <decimad2> If I set a path and a time for completion then that path and the given time must be compatible with the feed rate, or the feed rate must be compatible with the time, plus the maximum rates of the axes must be taken into consideration. I cannot see how the CAM-software does not need the kinematics. [14:38:13] <decimad2> I think I will try write a simple generator g93-base generatir and play around with custom kinematics in the times coming. Thanks for your explanations and the links! [14:38:40] <decimad2> Gosh, reformulating shouldnt be done in a hurry, sorry. [15:13:28] <cradek> skunkworks: can I have the gcode that does weirdness in 2.6? [15:24:31] <decimad2> writing to tv_sec twice? [15:59:31] <dirty_d> I'm confused, what hal function does linuxcnc call when it wants to output a signal on a pin? [16:05:25] <dirty_d> so the parport driver exports a function that actually writes to the parport and gives it a name i.e "parport.0.write"
[16:10:21] <skunkworks> cradek, can you re-produce? I exported with 4 digits just to make sure it wasn't something odd with that but it did the same thing. [17:09:29] <dirty_d> ok, so the stepper driver would just directly set the values of the signals on the pins, then call the parport write exported function? [17:13:07] <kwallace> The stepper driver takes in position information and outputs step and direction signals. The .hal file connects the stepper signals to the parport driver. [17:14:44] <archivist> dirty_d, what microcontroller? [17:20:31] <dirty_d> is that just he way its made, or is there some fundamental reason the step sigals couldnt be computed ahead of time and then executed in real time by other hardware? [17:23:30] <kwallace> dirty_d, a key concept to motion control or real-time is not speed but getting the various bits that need to happen at the same time, to actually happen on time. To go from point A to B, all three axes must get the appropriate number of steps at each way point at the same time. [17:26:06] <ssi> so think about homing... you queue a bunch of steps into your off-pc buffer, and it starts moving the axis, and then you get a home switch trip; where exactly was the axis when it tripped? [17:29:58] <CaptHindsight> what's a Rpi + IO board cost? [17:30:33] <dirty_d> linuxcnc works with the serial port too right? [17:32:47] <kwallace> I think cradek means you _can_ toggle pins on the serial port just like the parallel port. [17:33:56] <kwallace> Could be handy. [17:35:29] <kwallace> I guess one would need to account for the +/- 12 Volt signal? [17:38:01] <micges-dev> cradek: what's new in ja6? [17:38:31] <micges-dev> cradek: rebased on newest master? [17:40:27] <ssi> are there any plans to move ja to master? [17:46:17] <dirty_d> what needs to happen in realtime in the pc though? [17:46:43] <ssi> didn't we just have this conversation 20 minutes ago? [17:48:40] <CaptHindsight> how does RAMPS handle servo or other closed loop real time IO? [17:59:01] <CaptHindsight> as much as I love the con men behind many of the *dunio and reprap projects where is a good place to publish an article clearing up the differences between Linuxcnc and what they are peddling? [18:01:09] <cradek> the blogosphere maybe? [19:11:24] <jepler> .. time to start packing up, I guess. [19:15:41] <kwallace> Realtime Linux as in being part of regular Linux? [19:16:55] <dirty_d> is boost-python a library? [19:22:20] <kwallace> I could be way off, but it (Boost) may be needed for parts of LinuxCNC that is written in C++? [19:45:18] <seb_kuzminsky> ahem, "haw yea, that was nearly right, and maybe this is closer"
[19:46:57] <seb_kuzminsky> airplane time for seb! [19:47:08] <seb_kuzminsky> the hackfest was wonderful! can't wait for next year! [19:58:41] <kwallace2> Bummer, I've used MAH's log to check IRC history, but I guess he isn't logging any more? [20:04:00] <kwallace2> micges-dev, thank you. [20:14:35] <brianmorel99_wor> dirty_d: What version are you trying to build? [21:09:20] <kwallace2> Hmm... My pogo sockets call for a .067 (#51) drill, bit but that gives .0015 clearance which is fairly slippery. I was hoping for a light press fit. The next drill size down, .0635" (#52) is way too tight. I may have to put a dab of silicone on the far side of the sockets to keep them from falling out? [21:40:04] <dirty_d> are you developing against an older version of boost? [22:17:35] <jepler> dirty_d: please submit a bug on sourceforge or a pull request on github. [22:18:47] <jepler> github is jepler/linuxcnc-mirror, we respond to pull requests there. [22:36:07] <seb_kuzminsky> Auto packing the repository in background for optimum performance. [22:56:26] <decimad2> I'm beginning to see a pattern there!